To remain one of the world’s premier outdoor furniture manufacturers for decades requires tireless work and effort. Starsong’s Sirio Collection has long been considered one of the worlds luxury patio furniture lines. Starsong’s team of designers and artisans travel the world to continually recognize trends from the design markets of Paris, Milan and New York and bring those ideas to the Starsong studios on the Northern California Coast. Meeting with some of the world’s top luxury outdoor furniture retailers such as Costco, they collaborate to ensure the Sirio Collection continues to fulfill the requirements for buyers around the globe. Paying the utmost attention to even the smallest detail, these finished designs are then sent to the Starsong factories located around the world. Using only the finest quality materials available, each piece is hand made to exact specifications. One glance and you will notice the Sirio Collection’s fine hand crafted detail. The extruded resin wicked goes thru intense quality control to insure consistency, the aluminum is all hand welded for added strength and the fabrics and tailoring are done in an old school bespoke styling. The attention to detail doesn’t end at the production process but continues thru the packing and shipping process as well. All pieces of the Sirio Collection are packed with the utmost care using commercial grade materials and shipped direct to your home or business. In many cases white glove delivery is available and your Sirio patio furniture will be taken to your outdoor living space, professionally unpackaged, arranged as you desire and all of the packaging materials removed from the premises. One of the things that sets the Sirio Collection apart in the luxury outdoor furniture market is the use of commercial grade materials without that cookie cutter commercial feel. From the Niko Collection, Starsong’s most popular premiere patio collection, every piece features designer styling and coloring. The soft smooth lines of the deep seating sets flow with the background and add ergonomic appeal and comfort. The dining collections utilize natural elements and in European tradition are so comfortable it’s a joy to sit for hours engaged in conversation and company of friends and family. The most popular and complete luxury outdoor furniture line from Starsong is the Niko collection. The Niko deep seating sectional comes in a 6, 8, or 10 pc size to fit all outdoor living spaces. Clean sleek lines, a modular European design and Sirio quality handmade construction make the Niko collection perfect for any outdoor living area. Whether your needs call for an extended oversized sofa and coffee table, a sofa with double chaise, a double chaise and 2 side chairs, or any of the other many possible configurations, the Niko collection from Sirio adapts easily to fulfill your ever changing needs. 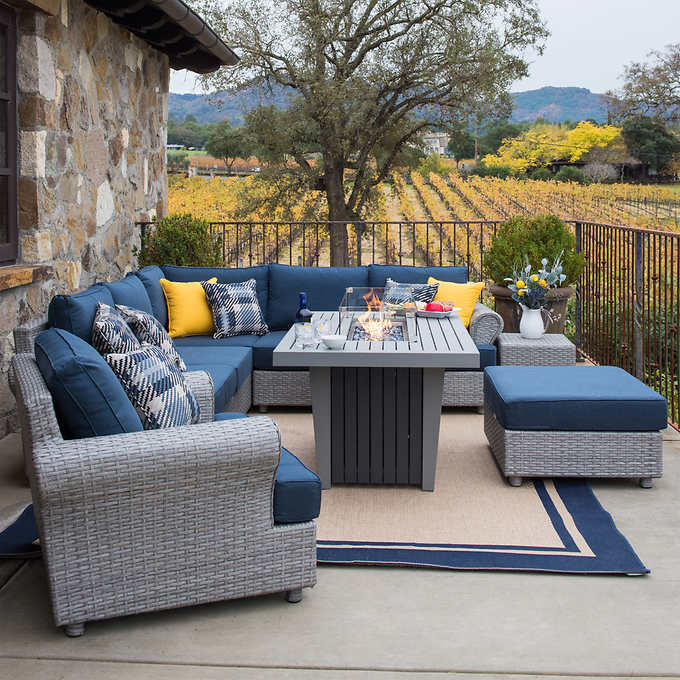 Consisting of multiple modular pieces made of tight hand- woven resin wicker covering a hand welded heavy gauge all aluminum frame, the Niko collection is designed to withstand the elements of all locales. The seat and back cushions as well as all accent pillows are covered in Sunbrella fabric over a polyfiber filling. The additional serving cover converts the ottomans to a flat surface perfect for that cold beverage or snack. Regardless of your current or future outdoor living area layout, the versatile, modular Niko collection from Sirio will add function and style for years to come. Add warmth to any transitional season with the best-selling Niko Fire Table by Sirio. As a perfect complement to your Niko Deep Seating collection, or any outdoor seating space, the Niko Fire Table is in a rich brown or gray color with a contrasting ceramic tile top. The controlled flame provides the perfect amount of warmth. The surrounding table is the perfect spot to place that evening snack or toasty warm beverage. Constructed with the latest materials and designed to withstand all elements and seasons, The Niko Fire Table by Sirio will bring ambiance and warmth to any season. If your space does not allow for both a sectional and fire-table, we’ve got the perfect choice for you. On those chilly desert nights or cool afternoons along the ocean, enjoy your outdoor living space with family and friends with the Niko 5-piece Fire Chat Set. The set includes 4 motion club chairs with swivel bases and a communal fire-pit table to add both warmth and ambiance. Cushions and pillows are in a contemporary Sunbrella fabric with zippered and removable covers for easy cleaning. 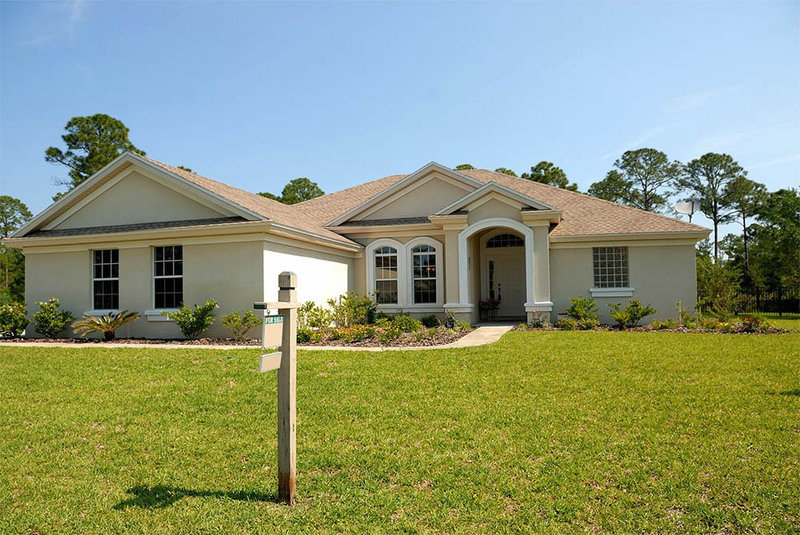 Cushion and pillow filling is an eco-friendly material designed for years of stress free continuity and easy drainage. Warm those chilly evenings and enjoy an intimate evening with this classic patio set. Another popular collection in the Sirio furniture family is the Soho Collection, and one of the more popular pieces is the Soho 6-piece Deep Seating Set. This contemporary and stylish set is very versatile, and can be configured in many ways to best fit your outdoor entertaining needs. When the summer nights come to an end and those mild autumn nights start rolling around, light up the fire table and continue enjoying your outdoor space without worrying about tending to smoke or ashes. 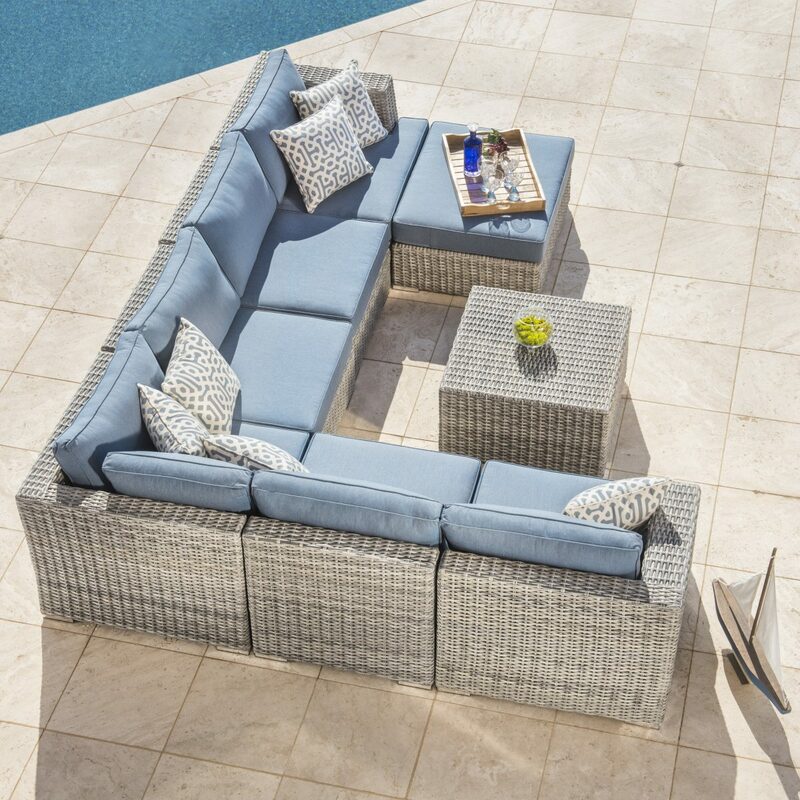 The set’s durable and lightweight all weather resin wicker and aluminum frame allows for easy rearranging and great protection against the elements. 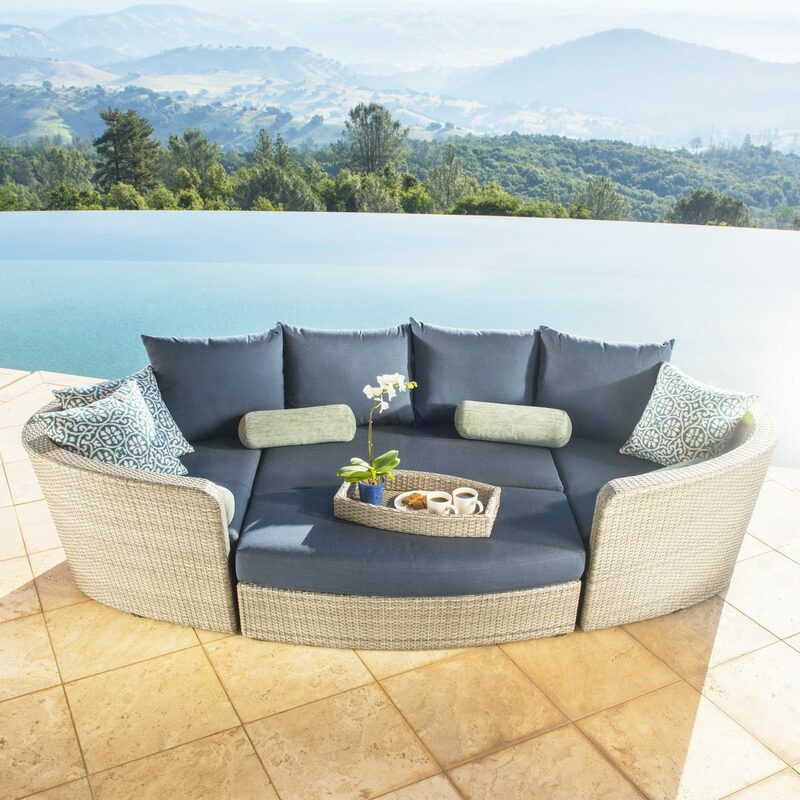 No matter what your outdoor entertaining needs are, this Soho 6-piece deep seating set should help fulfill what you’ve envisioned for your space. Sirio’s Venice collection boasts one of Starsong’s more unique modular furniture pieces ideal for any space. 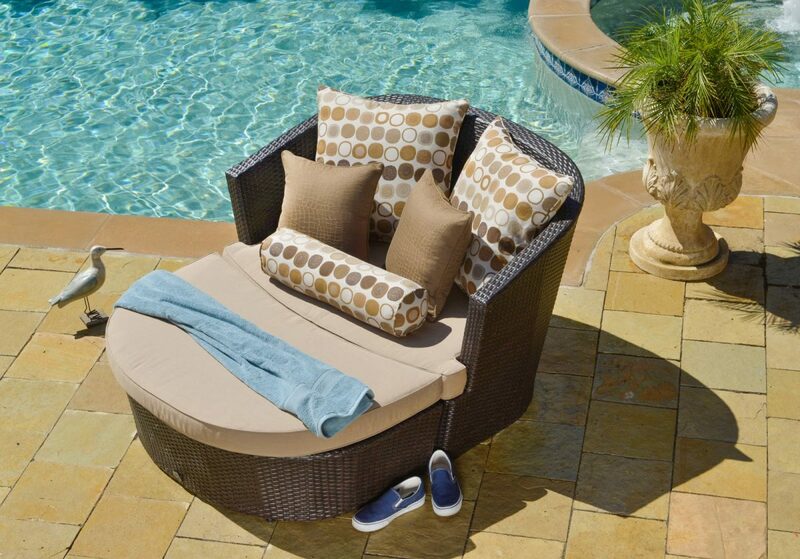 The Venice 4-piece Patio Modular Deep Seating Lounge Set is the best piece to have for optimal relaxation. This small, yet extremely functional set can be taken apart and reconfigured in different ways to create individual seats where guests can kick up their feet, or combined altogether to assemble a comfortable day bed. This stylish set is sure to bring a high level of sophistication and comfort to your outdoor space for years to come. Bring your indoor aesthetics outdoors with the Regency 9 piece Modular Seating Set by Sirio. 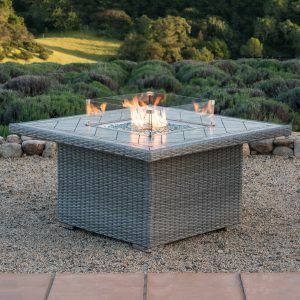 This stylish modular seating set and fire table brings optimal functionality and quality comfort to any outdoor living space. The slate gray resin wicker and Sunbrella fabric are designed to withstand the seasons, and the powder coated aluminum frame is hand welded for excellent durability. With a designer feel, quality durability, and matchless comfort, add the Regency 9 piece Modular Seating Set by Sirio to your backyard today. 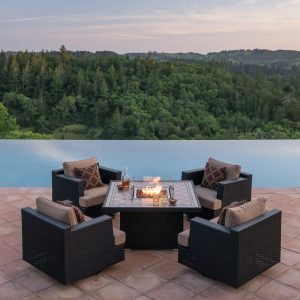 Many different furniture pieces and patio sets from the Sirio Collection by Starsong are currently being enjoyed in the outdoor living spaces around the world — from some of the finest villas along the shores of Lake Como and Lago de Garda in Italy, to the oceanside mansions of Newport Rhode Island and sprawling ranches along the red rocks of the western US. Whether you are looking for outdoor sofas, lounge chairs, or dining sets, the Sirio collection perfectly merges timeless designs with optimal comfort. Stay tuned for our new upcoming designs, discounts, and seasonal collections by subscribing to our mailing list by entering your email address below. You can also visit our Costco brandstore for the latest deals on pieces from the Sirio Collection. You don’t need to spend a fortune or own an estate or villa to make your outdoor living space feel like a 5- star resort — all you need are quality, affordable luxury patio furniture from Starsong’s Sirio Collection. ← Starsong Giveaway: Enter to Win a 3 Piece Bistro Set for Your Outdoor Space!